If you have a N:N relationship between two entities and when you try to associate or disassociate records either from Associated view or Sub grid. In Plugins, the Associate & Disassociate messages behave little different than other messages. When you register a plugin on Associate message, you have to leave “Primary and Secondary” entities as ‘none’. Since we don’t provide entity names, the registered Plug-in step triggers on all “Associate” operations, so we have to check few conditions to let the “Association” trigger happen only between intended entities. Will this work 1: N relationship. Please confirm? When i put a plugin with a step associate or dissociate it don’t activate itself when i link two entities. have i misunderstande this event? Suppose i have a custom entity Registration and Individuals and I have N:N relationship created. Below is my sample code not yet used in my plugin. associate message – when this will be triggered? I have the individual lookup field in Registration entity. I also see that when I save the registration record with individual lookup value selected. I see this record in registration entity associated view. 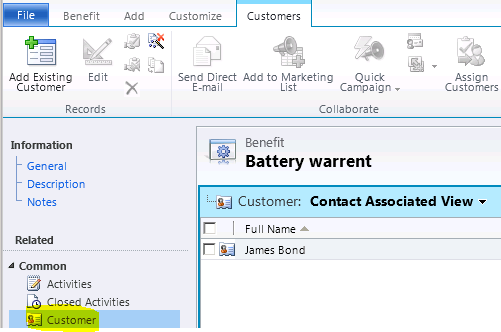 Please help me understanding the associate/disassociate plugin of CRM. Disassociate – Triggers when you remove either ‘Registration’ or ‘Individual’ records from Associated View grid. gives me the real relationship name followed by a period. This was hard to catch since it looked right at a quick glance! Thanks for feedback. But I could not find any discrepancy.